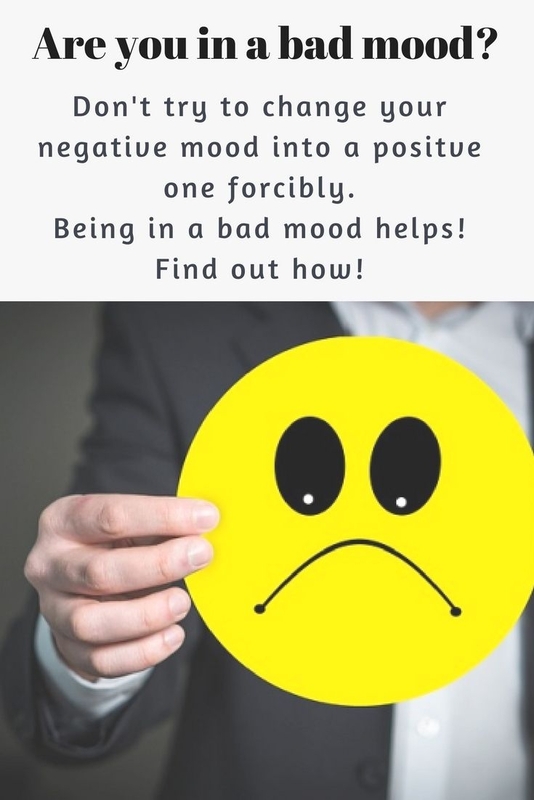 Bad Mood Can Make You Productive? We all have have been bombarded with advice such as "Think positive", Banish negative thoughts", "Always try to be in a good mood. ", "See the brighter side of life" , "Count your blessings" and so on and so forth. Self-help books are rife with such advice about positivity and the superiority of being in a state of happiness all the time. But is forcing oneself to be happy all the time a good thing? Feeling sad isn't as bad as you think. According to "Psychology Today", this societal overemphasis on positive emotions and underrating negative emotions is not a good thing. Pretending to be happy or forcibly trying to repress a negative emotion could in fact make a person feel more worse or depressed. Psychology professor, Svend Brinkmann in his bestseller Stand Firm: Resisting the Self-Improvement Craze says, “I believe our thoughts and emotions should mirror the world. When something bad happens, we should be allowed to have negative thoughts and feelings about it because that’s how we understand the world.” There’s nothing wrong with those who have a naturally sunny disposition or who enjoy the odd self-help book. The problem is when happiness becomes a requisite, adds Brinkmann . The more pressure a person receives from his social environment not to experience negative emotions, the more likely that person is to experience an increase in depressive symptoms. Pushing back negative emotions could spawn more emotional overeating than simply recognizing that you were, say, upset, agitated or blue. [Source]. Never suppress your negative feelings. The best way to get rid of a negative feeling as quickly as possible is not to push it away, but to accept it. Acknowledge how you are feeling without rushing to change your emotional state. Learning how to cope with those emotions is the key. . So if you are in a bad mood, don't feel guilty about it and pressurize yourself to change your emotion. Negative emotions are important for our overall well-being and mental health. Can being in a bad mood make you more productive? A new research has shown that for some people, being in a bad mood can help focus attention, manage time, and prioritise tasks better. In fact, researchers found being in a good mood may hamper time-keeping and organizational skills. However, this was only true for extroverts - while introverts ground to a halt when they felt gloomy. Meanwhile, low-reactive people showed the opposite effect: their abilities would grind down to a halt when they were in a bad mood. Bad Mood helped me complete my tasks way quicker than usual. Well, I have to admit that I'm not a very organized person and am often prone to procrastination. But it was one of those days or rather that time of the month (PMS) when I was feeling irritable and edgy. I was feeling upset at the slightest things happening around me and I was particularly mad at someone in my family for something that happened though it wasn't that poor person's fault. With such a temperament, I locked myself in my room in front of my laptop and set about to complete the tasks assigned to me. And surprisingly, I completed the chores in a matter of 2 hours; usually it takes me 4 hours to complete it if I'm in a normal frame of mind. I felt elated at my productiveness that day. And my foul mood vanished all of a sudden to be replaced by a feeling of contentment. This change of mood should always be a natural occurrence; one should never forcibly try to change it! It's also a myth that women aren't at their productive best and experience brain fog when they are in the throes of PMS. Somehow bad mood did help me to be productive that day! As a matter of fact, I am not much of an extrovert; so even though the study concludes that this does not hold true for introverts, this was not applicable to me. And I have to mention that this was not a one-off occurrence. Many a times when I'm not particularly feeling too good, I have noticed that I tend to be more productive. So I kind of agree with this study, though this 'introvert' part doesn't fit in my case. So dear readers, has bad mood ever goaded you to become productive? How do you deal with your moods and negative emotions? Do you try to stifle your negative feelings or do you embrace it and experience it? Do share your thoughts in the comments. Also read: Managing Interruptions Effectively And Becoming More Productive. for some people, being in a bad mood can help focus attention, manage time, and prioritise tasks better.